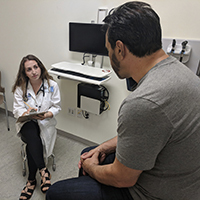 The scenario constructed for the Oregon Health & Science University’s OSCE case of a patient with low-back pain appears straightforward, but in the hands of a professional actor, its elements provide enough twists and turns to mimic the complexity of typical patient encounters. 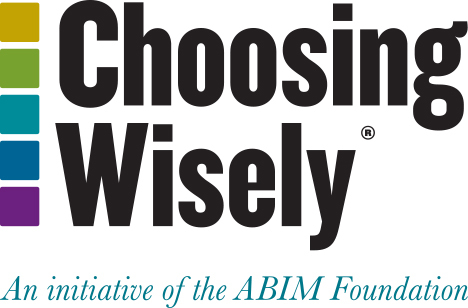 Under a grant funded by the ABIM Foundation, the Low Back Pain OSCE was revised to incorporate Choosing Wisely recommendations from seven specialty societies that addressed how to treat complaints of low-back pain, including avoiding routine imaging and avoiding prescribing opiates. The script of OHSU’s Low Back Pain OSCE outlines background of ailment, symptoms, pain scale, past medical history as far back as five to 15 years, medications, social history, family history, and miscellaneous lines in which the actor requests imaging and stronger pain meds. An OSCE, Objective Structured Clinical Examination, is an assessment designed to test clinical skill performance and competence through role-play. An actor portrays a patient, and the medical student has to navigate a simulated discussion to come a shared decision about care. The Low Back Pain case educates medical students in making clinical decisions in a cost-conscious manner and allows students to practice explaining and discussing these concepts with patients. The aim of the Foundation grant was to integrate Choosing Wisely recommendations into OSCE cases for its Family Medicine Core Experience as a required component of the curriculum. The grant team created case scenarios, standardized patient scripts, checklists and faculty guides for new OCSEs and revised existing cases where Choosing Wisely recommendations were applicable. “We also made sure to weave Choosing Wisely concepts into the faculty instructions teaching points. Faculty verbally share these concepts with the students after they complete their OSCE. This results not only in educating the student, but also the faculty and the actor,” said Dr. Frances Biagioli, Professor and Vice Chair, Education for OHSU Family Medicine, referring to the low back pain case. Some of the new scripts involve patients requesting prescriptions to combat sinusitis, and also during the visit, requesting other medical services such as a bone-density test. “Patients commonly do this,” said Biagioli, explaining that patients often see something on the internet or hear advice on television and then ask for screenings such as DEXA scans for measuring bone density. An unexpected, yet positive outcome of adding Choosing Wisely recommendations throughout the OSCE cases is that faculty are learning more about avoiding unnecessary treatments and procedures as well, said Biagioli. She has heard from fellow faculty who have observed and evaluated the OSCEs that they have found themselves applying Choosing Wisely standards in their own clinical practices. “By exposing more people to the concepts, we can get other people using them,” Biagioli said. In addition, since several of the OSCE cases focus on counseling, which does not require a physical examination, the cases can be easily used in telemedicine training, an emerging trend in medical education in the United States. Three other medical schools have adopted the OHSU’s Choosing Wisely case scenarios.